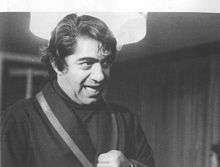 Ezzatolah Entezami (Persian: عزت‌الله انتظامی‎‎, born June 21, 1924) is an Iranian actor. Graduated from theatre and cinema school in Hanover, Germany in 1958, Entezami started his career on stage in 1941. He has been acting in movies since 1969. His debut performance in Darius Mehrjui’s admired classic film, The Cow(Gaav), received the Silver Hugo in Chicago International Film Festival in 1971. He shined in the role of a naive villager who cannot endure the death of his beloved cow and starts to believe that he is the cow himself. He is known as one of the most prominent actors in Iranian cinema and has been labelled as the greatest actor in history of the cinema of Iran. He has worked with most of the prominent Iranian film directors, including Darius Mehrjui (eight films), Ali Hatami (four films), Nasser Taqvaee, Mohsen Makhmalbaf, Behrouz Afkhami and Rakhshan Bani-Etemad. He has been awarded the Crystal Simorgh for the Best Actor twice from the International Fajr Film Festival, for Grand Cinema and The Day of Angel. His work and accomplishments were recognized in October 2006 at the Iran cultural center in Paris. His son, Majid Entezami is an Iranian film score composer. ↑ بزرگداشت عزت الله انتظامی در پاریس (in Persian). Retrieved 2007-04-28. 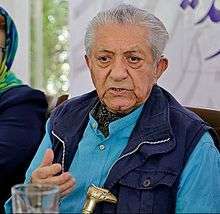 An interview with Ezzatollah Entezami in connection with the recently produced biopic "... and the Blue Sky", directed by Ghazaleh Soltani and produced by Ghasem Gholipour, Mehr News Agency, 21 November 2010, (in Persian). Photo reportage of the interview: .